The tunic atoned for bloodshed… the breeches atoned for lewdness… the turban made atonement for arrogance… the belt atoned for [impure] meditations of the heart… the breastplate atoned for neglect of civil laws… the apron atoned for idolatry… the cloak atoned for slander… and the crown, worn on the forehead, atoned for brazenness. 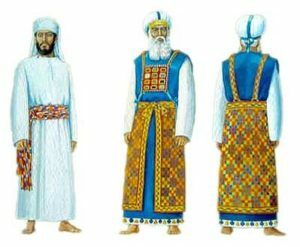 The tunic (kutonet) was a simple white garment worn over the body which all of the priests (not only the High Priest) wore. The Talmud says it atoned for bloodshed, and proves it through a gzerah shavah, a form of interpretation where the exact same word (or root of a word) appears in two different contexts, thus allowing a connection between the two to be made. In Genesis 37:31 we read how, following the sale of Joseph, his brothers slaughtered a goat and dipped Joseph’s special robe in the goat’s blood. They used the bloodied robe as proof to show their father Jacob that Joseph had been murdered or devoured by an animal. 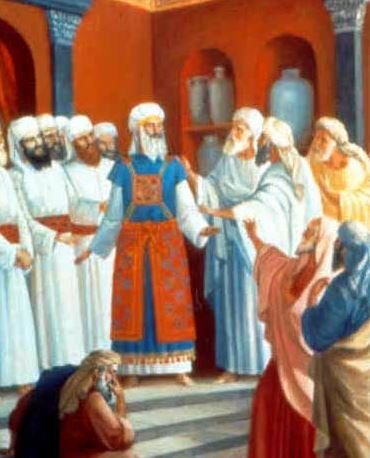 The word used for Joseph’s robe is kutonet, too, that same word used for the Kohen’s garment. From this we can learn that the kutonet atoned for bloodshed. The breeches (michnasei bad) were white pants worn to cover up the lower half of the body, and atoned for sexual immorality. The Talmud proves it from an explicit verse in the Torah (Exodus 28:42) where God commanded that the pants be made “to cover up the flesh of their nakedness”. The Hebrew term here is precisely the one used to denote sexual indecency (‘ervah, or gilui arayot). The white turban (mitznefet) atones for arrogance. Rabbi Hanina explains here that the turban was worn on the head at the very top of the body, and thus atoned for people who similarly put themselves “at the head” above other people. The last of the four garments worn by the regular priest is the avnet, a sash or belt. Made of red, blue, and purple wool, it was the only multi-coloured garment worn by the regular priest. It atoned for impure thoughts, and the Talmud says we know this from the fact that the sash was worn tied around the heart. Contrary to what we may expect, this was not a belt to hold up the pants, but rather an independent garment wrapped around the upper body. In Jewish thought, the heart is the seat of the yetzer hara, the evil inclination, which tries to make a person sin by throwing improper thoughts into their head. The heart is also the seat of the yetzer hatov, the good inclination. These two opposing forces both reside in one’s heart. Because of this, the term for “heart” used in the daily Shema is levavecha, and not the more grammatically consistent libecha. The former has an extra letter beit, the doubled language alluding to the two inclinations in the heart. Our Sages teach that one should always keep their mind above their heart, in full control of their inclinations. The brain should dominate the heart, and the heart should dominate the liver. The Hebrew word for liver, kaved (כבד), is directly related to kavod (כבוד), “honour”. Thus, the liver is the source of pride and arrogance. These organs are arranged physiologically in the body the way they are to teach us a lesson: the brain (or intellect) should be on top, then the emotions of the heart below it, and the ego at the very bottom. If one accomplishes this, with their brain, moach (מוח) in Hebrew, being above their heart, lev (לב), and their heart being above their liver, kaved (כבד)—then they become a melekh (מלך), “king”. If the letters are reversed, where one’s honour trumps their emotions, which in turn overrule their reasoning, then they are klum (כלם), “nothing”. 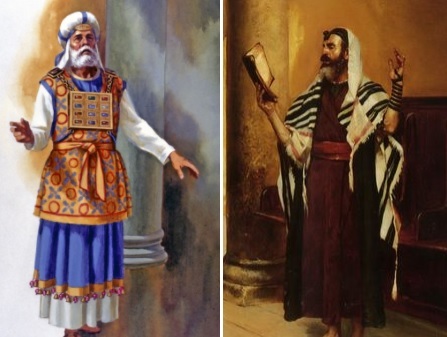 The High Priest wore an additional four unique garments. On his forehead was the golden plate known as the tzitz, which atoned for brazenness. This is proven by another gzerah shavah between Exodus 28:38, which commands the priest to wear the plate upon his metzach, “forehead”, and Jeremiah 3:3 which speaks of the brazen “forehead” (again metzach) of a licentious woman. Rav Yitzchak Ginsburgh points out that the term for bell, pa’amon (פעמן) refers to something that resonates, and the same root is used, for example, in describing how the Spirit of God resonated within—l’fa’amo (לפעמו)—the Biblical judge Samson (Judges 13:25). Rav Ginsburgh beautifully notes how the gematria of “Spirit of God” (רוח ה׳) is 240, equal to that of pa’amon (פעמן). It is also equal to meil ha’ephod (מעיל האפד), the full title of the garment, as in Exodus 29:5 or 39:22. He concludes that if one wishes to have the Spirit of God rest upon them, the key is to refrain from any evil speech. The ephod, or apron, atoned for idolatry. This is derived from Hosea 3:4: “For the children of Israel shall sit solitary many days without king, and without prince, and without sacrifice, and without pillar, and without ephod or teraphim.” The verse is taken to mean that where there is no ephod, there will be teraphim—various implements of idol worship. The word “teraphim” appears multiple times in the Tanakh (as in Genesis 31:19 and Judges 17:5), nearly always in relation to idolatry. Upon the ephod was the famous choshen, the breastplate that, according to tradition, allowed for communication with the Heavens. The breastplate atoned for violations of dinin, civil law. We know this from the fact that the Torah calls the breastplate choshen mishpat (Exodus 28:15), literally “breastplate of judgement”, with the term mishpat typically referring to court cases and civil law (whereas chukim and edot refer to religious-based, historical, or ritual laws). In this way, even the very clothes of the Kohen helped him fulfill his main duty of bringing atonement for the people. Yet, in the past two thousand years, there has been no Temple and no priestly service. Might there be something in its stead? When the Temple was destroyed, our Sages instituted a number of practices in place of those Temple rituals. They declared that “as long as the Temple stood, the altar atoned for Israel, but now a man’s table atones for him” (Berakhot 55a). Just as the priests would wash their hands in a special basin before starting their services (and before eating terumah), the Rabbis instituted netilat yadayim, the ritual washing of the hands before starting a meal. Just as the sacrificial meat was required to be brought with salt, it became customary to dip the bread in salt before eating it. In place of the Temple menorah we have the Chanukah menorah, and in place of the Temple showbread we have two challahs, each traditionally braided with six strands to represent the twelve loaves once displayed in the Temple. In many ways, the Talmudic sages and rabbis saw themselves filling the role once held by the ancient priests. More importantly, they taught that every righteous Jew should see himself as a priest. After all, God intended for all of Israel to be a “kingdom of priests and a holy nation” (Exodus 19:6). In fact, many commentaries agree that it is only because of the Golden Calf incident that the tribe of Levi was appointed to take over the priesthood. Were it not for that tragedy, every firstborn male would be a priest, and any other Jewish male could voluntarily enter the priesthood. To this effect, the Talmud (Bava Kamma 38a) goes so far as to state that “even a non-Jew who occupies himself with Torah is comparable to the High Priest.” A person who lives in Torah and refines himself to the highest degree is likened to the greatest of priests, at least in a spiritual sense. The “bells” along the hem of the tallit. The tzitz headplate worn on the top of the forehead is like the head tefillin worn “between the eyes”, while the choshen breastplate worn over the heart is like the arm tefillin which is supposed to be worn in line with the heart. The ephod that was worn over the shoulders and stretched down below the waist is like the tzitzit katan garment worn over the shoulders with its fringes hanging down below the waist. 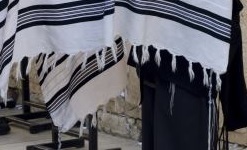 The woolen tallit with which we wrap ourselves, with its customary blue stripes to remember tekhelet, is like the special blue meil that was made of fine tekhelet wool. And just as the meil had pa’amonim bells along its hem, the tallit, too, customarily has bell-like knots along its hem. In this way, every Jew has the ability to elevate to a priest-like status, especially in lieu of a Temple, and in light of the Torah’s statement that all of Israel is a “nation of priests” (Exodus 19:6). Each Jew can bring about atonement, not only for himself but for his people as a whole, and each Jew can spread evermore divine light into the world. This entry was posted in Jewish Law & Life Cycle, Personal Development and tagged Aaron, Atonement, Bava Kamma, Berakhot (Tractate), Brain, Clothing, Gematria, Heart, High Priest, Kohen, Liver, Pekudei, Priestly Vestments, Rabbi Chanina, Rav Yitzchak Ginsburgh, Tefillin, Teraphim, Tzitzit, Yetzer HaRa, Yetzer haTov, Zevachim (Tractate) on March 4, 2019 by Efraim Palvanov. What Does God Ask Of You? In this week’s parasha, Ekev, we read: “And now, Israel, what does Hashem, your God, ask of you? Only to fear Hashem, your God, to walk in all of His ways, and to love Him, and to serve Hashem, your God, with all your heart and with all your soul.” (Deuteronomy 10:12) Moses instructs his people that they should sincerely love, fear, and serve God. We have written in the past how the Sages say that loving God and serving God is often best done by loving and serving His creations. The Midrash compares this to a servant who takes care of the king’s son. Surely, the king will love such a servant and wish to bestow goodness upon him, for the servant cares for the king’s beloved child. As the Torah calls us all children of Hashem, the King, it goes without saying that those who take care of God’s children are naturally beloved by God. This is the quality that made Aaron so special, and, according to some, earned him the merit of being chosen the progenitor of the priestly lineage. Pirkei Avot (1:12) famously instructs us to be, above all else, like Aaron (and his disciples): “loving peace and pursuing peace, loving all people, and bringing them closer to Torah.” Elsewhere in Avot (3:10), we are told that “One with whom his fellows are pleased with, God is pleased with.” The Kabbalists beautifully point out that the gematria of the command to love God (ואהבת את יי אלהיך) is 907, the same as the command to love your fellow (ואהבת לרעך כמוך אני יי), for one is impossible without the other. This is what the prophet Michah concluded when he, too, asked the same question as Moses did: “… And what does Hashem request of you? Only to act justly, and to love kindness, and to walk modestly with your God.” (Micah 6:8) Be just and treat everyone fairly; be kind and genuinely love to help others—and do it all humbly and modestly. When man is led in for Judgment, he is asked: Did you deal faithfully? Did you fix times for learning? Did you engage in procreation? Did you hope for salvation? Did you engage in the dialectics of wisdom? Did you understand one thing from another? The wording of the Talmud is that a person will be asked if they took care of their finances b’emunah, “in faith”. Unfortunately, there are plenty of people who seem faithful, but engage in all kinds of financial tricks under the table. A person cannot be of great emunah if, at the same time, they cheat in financial matters, or are even a little bit dishonest with money. This includes gambling, stock market speculation, and all sorts of tax deceptions which have become so commonplace in our time. Similarly, the third question refers to procreation, for without it, too, humanity would cease to exist. More specifically, without Jewish procreation, there would be no Jews, and therefore no one to uphold that Covenant. The schools of Hillel and Shammai debated what it takes to fulfil the mitzvah of procreation (Yevamot 62a). 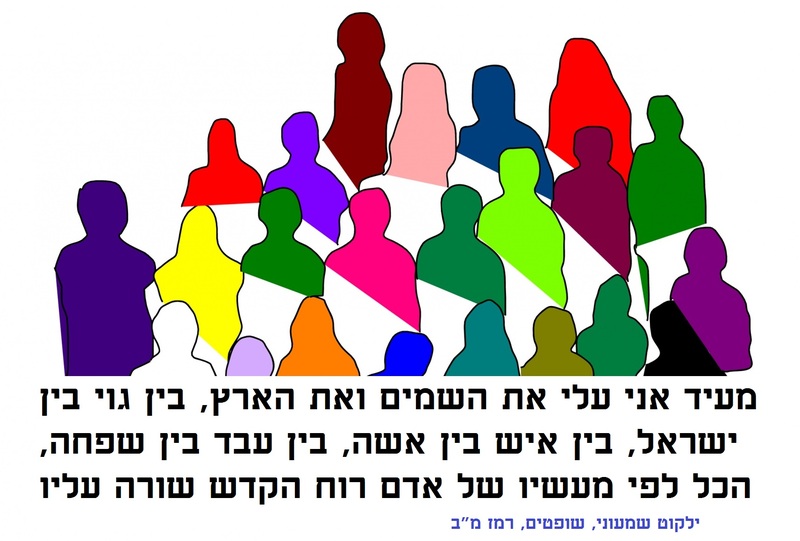 According to Hillel, a person must have one boy and one girl, while according to Shammai, a person must have two boys and two girls. The reasoning of the latter is that Eve initially had four children: Cain, Abel, and the sisters each was born with. The first instance of pru u’rvu in the Torah resulted in two boys and two girls, so this is the standard for fulfilling the mitzvah. However, the Talmud goes on to note another opinion that it was Shammai that taught one must have at least one boy and one girl, whereas Hillel taught that a person must simply have at least one child, whether boy or girl. The most lenient opinion, therefore, is that a person fulfils the mitzvah by having a single child, while the praiseworthy has at least two of each. A person who adopts a child or “raises an orphan” fulfils the mitzvah as well (Megillah 13a). Anyone who comes to the conclusion that he should involve himself in Torah study without doing work and derive his livelihood from charity, desecrates God’s Name, dishonors the Torah, extinguishes the light of faith, brings evil upon himself, and forfeits the life of the World to Come, for it is forbidden to derive benefit from the words of Torah in this world. Our Sages declared: “Whoever benefits from the words of Torah forfeits his life in the world.” Also, they commanded and declared: “Do not make them a crown to magnify oneself, nor an axe to chop with.” Also, they commanded and declared: “Love work and despise rabbinic positions.” All Torah that is not accompanied by work will eventually be negated and lead to sin. Ultimately, such a person will steal from others. 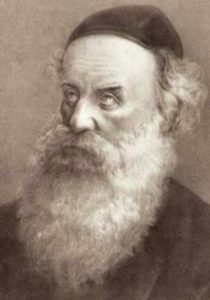 Although the Rambam makes it clear that Torah study is of absolute importance, and should take precedence over one’s worldly occupation, he nonetheless reminds us that “the greatest sages of Israel were lumberjacks and water-drawers…” (ibid., 1:9) To be fair, there are other rabbinic authorities that allow for full-time Torah scholars who make learning their occupation, but this must only be for a minority of distinguished thinkers. It is certainly not a standard for everyone, for that would be completely unsustainable. To get back to the third question, the Sages state that having children “hastens the Redemption”. There are a certain number of souls (in a Heavenly repository called “guf”) that must be born, and only when all of these souls have been born can Mashiach come. Thus, having children accelerates the time of Redemption. This ties into the fourth question a person is asked: did they look forward to the Redemption? The wording is not if they waited for the Redemption, or hoped for it. Instead, whether they looked forward to it, suggesting a more active form. It isn’t enough to passively wait for the Redemption. Each person must do what they can to hasten it. This includes things like doing more acts of kindness and showing ahavat chinam, expressing baseless, non-judgemental love for all fellow Jews (Yoma 9b); engaging in kiruv; and, of course, repenting wholeheartedly (Sanhedrin 97b). Each person has to continue working on themselves to be ever-more righteous. Increasing one’s charitable donations hastens the Redemption, too (Isaiah 1:27 and Bava Batra 10a). The final two questions deal with one’s knowledge and understanding. It isn’t enough to engage in light learning here and there. A person must be steeped in dialectics (pilpul) and understand the depths of one thing from another (davar mitokh davar). The Arizal taught that a person must learn Torah on all four of its levels; pshat (simple), remez (sub-textual), drash (metaphorical), and sod (secret). These levels are collectively known by the acronym pardes, “orchard”—a word that is also the origin of the English “paradise”. One who doesn’t learn Torah on all four levels has not fulfilled the mitzvah of Torah study and will return in a reincarnation to do so (Sha’ar HaGilgulim, 16). The Arizal also taught that Torah study not only strengthens a person spiritually, but literally creates a “garment” for the soul to be worn in the World to Come (Sha’ar HaPesukim, Tehillim). This is the meaning of the verse “The Torah of Hashem is perfect, it restores the soul” (Psalms 19:8). Meanwhile, the power of Torah study is so great that it creates angels, and these angels could eventually communicate with the student and bestow Ruach HaKodesh, divine inspiration, upon them (Sha’ar Ruach HaKodesh, 1). First, he would read the weekly Torah portion. On Sunday, he would focus on the first six verses. On Monday, the next four. On Tuesday, the next five, and on Wednesday the next six. Another five on Thursday, making a total of 26 verses, and then the whole parasha on Friday. This was done in the traditional manner, shnaim mikra v’echad targum—reading each verse twice in Hebrew, and once in Aramaic. Next, he would study a portion of Nevi’im, the Prophets, followed by Ketuvim, the other Holy Writings that make up the Tanakh. This, too, was done with shnaim mikra and a targum. The Arizal then studied the Mishnah, followed by Gemara, together with the various commentaries. Finally, he engaged in Kabbalah. Rava derived the six questions above from Isaiah 33:6, where the prophet declares, “And there shall be faith in your times; strength, salvation, wisdom and knowledge…” Faith refers to the first question regarding faithful business, times refers to the second question of setting times for Torah-learning, strength to procreation, salvation to the Redemption, wisdom and knowledge to the last two questions. The Isaiah verse concludes with “… the fear of Hashem is His treasure.” One’s rewards (treasure) in the afterlife are contingent upon these six questions. Yet, what unifies them all is yirat Hashem, “fear” or “awe” of God. One who is truly God-fearing will undoubtedly be scrupulously honest with financial matters, and strive to hasten the Redemption. It is doubtful that a Jew can be truly God-fearing without constantly meditating upon Torah and understanding its depths. Thus, complete yirat Hashem encompasses all of these things. Conversely, a person who does not live these ideals is probably not as God-fearing or faithful as they might believe themselves to be. This entry was posted in Jewish Law & Life Cycle, Personal Development and tagged Aaron, Adam and Eve, Ahavat Chinam, Arizal, Book of Jeremiah, Business, Ekev, Emunah, Faith, Finance, Gemara, Gematria, Hillel and Shammai, Honesty, Isaiah, Kabbalah, Kiddushin (Tractate), Megillah (Tractate), Micah (prophet), Mishnah, Mitzvah, Money, Nefesh, Oral Torah, Pirkei Avot, Procreation, Proverbs, Psalms, Rabbi Shimon ben Netanel, Rambam, Rava, Redemption, Reproduction, Sanhedrin (Tractate), Sha'ar HaGilgulim, Sha'ar HaMitzvot, Sha'ar Ruach haKodesh, Shabbat (Tractate), Sifre, Torah Scholars, Torah Study, Yevamot (Tractate), Yoma (Tractate) on July 30, 2018 by Efraim Palvanov. Is It Necessary to Have a Hebrew Name? 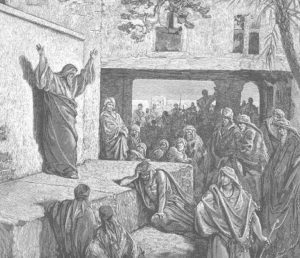 This week’s parasha is named after Pinchas, grandson of Aaron, who is commended for taking action during the sin with the Midianite women. Pinchas was blessed with an “eternal covenant”, and Jewish tradition holds that he never really died. Pinchas became Eliyahu, and as the Tanakh describes, Eliyahu was taken up to Heaven alive in a flaming chariot (II Kings 2). While we know what the name “Eliyahu” means, the name “Pinchas” is far more elusive. It doesn’t seem to have any meaning in Hebrew. Historical records show that there was a very similar name in ancient Egypt, “Pa-Nehasi”. Did Pinchas have a traditional Egyptian name? When we look more closely, we find that multiple figures of the Exodus generation actually bore Egyptian names. For example, “Aaron” (or Aharon) doesn’t have a clear meaning in Hebrew, and appears to be adapted from the ancient Egyptian name “Aha-Rw”, meaning “warrior lion”. Even the origin of Moses’ name is not so clear. Although the Torah tells us that Pharaoh’s daughter named him “Moshe” because she “drew him [meshitihu] from the water” (Exodus 2:10), it seems very unlikely that an Egyptian princess should know Hebrew so well and give her adopted child a Hebrew name. Our Sages noted this issue long ago, and grappled with the apparent problem. Chizkuni (Rabbi Hezekiah ben Manoach, c. 1250-1310) writes that it was actually Moses’ own mother Yocheved that named him “Moshe”, and then informed Pharaoh’s daughter of the name. Yet, the Midrash affirms that Yocheved called her son “Tuviah”, or just “Tov” (based on Exodus 2:2), and Moshe was the name given by Pharaoh’s daughter. Meanwhile, Ibn Ezra (Rabbi Abraham ben Meir ibn Ezra, 1089-1167) suggests that Pharaoh’s daughter called him “Munius”. Josephus takes an alternate approach entirely, saying that Pharaoh’s daughter (whose name was Thermuthis, before she became a righteous convert and was called Batya or Bitya in Jewish tradition) named him Moses because the Egyptian word for water is mo. 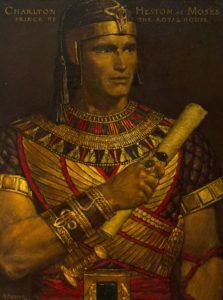 The most elegant solution might be that Pharaoh’s daughter called him “Mose” (spelled the same way, but pronounced with a sin instead of shin), which means “son” in Egyptian. This is most fitting, since Pharaoh’s daughter yearned for a child of her own, and finally had a “son”. In fact, we see this suffix (and its close variant mses, from which the English “Moses” comes) used frequently in Egyptian names of that time period, such as Ahmose, Thutmose, and Ramses. Thus, he would have been known as Mose (or Moses) during his upbringing, but later known to his nation as Moshe, with a more appropriate and meaningful Hebrew etymology, yet without having to change the spelling of the name (משה) at all. All of this begs the question: is it important to have a Hebrew name? And is it okay to have a Hebrew name together with an English name, or a name in the local language of wherever a Jew may live? Why Are So Many Sages Called “Shimon”? When looking through the names of the many rabbis in Talmudic and Midrashic literature, we find something quite intriguing. Although we would expect the Sages to be named after great Biblical figures like Moses, David, or Abraham, in reality there are essentially no sages with such names! Instead, we find a multitude of names of lesser-known Biblical figures, and many names that have no Biblical or Hebrew origin at all. One very common name is Yochanan: There’s Yochanan ben Zakkai and Yochanan haSandlar, Yochanan bar Nafcha, Yochanan ben Nuri, and Yochanan ben Beroka. Another popular name is Yehoshua. While we might not expect this name to be so popular (considering its association with Jesus), we still find Yehoshua ben Perachia, Yehoshua ben Levi, Yehoshua ben Chananiah, Yehoshua ben Korchah, and many others. There are also lots and lots of Yehudas like Yehuda haNasi (and his descendents, Yehuda II and Yehuda III), Yehuda ben Beteira, Yehuda bar Ilai, and Yehuda ben Tabbai. And there are tons of Elazars: Elazar ben Arach, Elazar ben Azariah, Elazar ben Pedat, and many more with the similar “Eliezer”. Perhaps the most common name is “Shimon”. There is Shimon haTzadik and Shimon bar Yochai, Shimon bar Abba and Shimon ben Shetach, Shimon ben Gamaliel (both I and II), Shimon ben Lakish (“Reish Lakish”), and more. We would think this is a strange choice, considering that the Biblical Shimon was actually of somewhat poor character (at least compared to the remaining Twelve Sons of Jacob). In fact, on his deathbed, Jacob did not bless Shimon at all, and instead said he wanted nothing to do with his violent nature. Moses, meanwhile, completely omits Shimon in his last blessings! So why would so many of our Sages be called “Shimon”? What might explain the strange selection of names among our ancient Sages? While no clear reason stands out, there is one plausible answer. It appears that the choice of names above was heavily influenced by the contemporary Greek society. Just as today many Jewish parents seek Hebrew names that also sound good in English, it seems parents back then wanted names that sounded good in Greek (since most Jews lived in the Greek part of the Roman, and later “Byzantine”, Empire). We find that Greek names tend to end with an “n”: Platon (“Plato” in Greek), Jason, and Solon, for example. Numerous others end with “s”: Aristotles (“Aristotle” in Greek), Pythagoras, Philippos. Indeed, many of our Sages actually have such Greek names directly: Yinon, Hyrcanus, Pappus, Symmachus, Teradyon, and Onkelos. There is no indication that these great rabbis had some other “Hebrew” name. Those that did want to bear Hebrew names could choose names already ending with an “n” like Shimon and Yochanan. Or, they could choose names where adding an “s” to the end would be easy: Yehoshua in Greek is Yeosuos (later giving rise to Yesus, ie. Jesus), while Yehuda is Yudas (Judas). Such names would be easy to convert between Hebrew and Greek. We know from historical sources that several people named Chananiah were simultaneously called “Ananias” in Greek. The same is true for Elazar or Eliezer. Many Greek names transliterated into English and other languages simple lose their “s” and end with an “r”: Antipatros becomes Antipater, while Alexandros becomes Alexander. In reverse fashion, Elazar could easily become Elazaros (or Lazarus)—very palatable in the Greek-speaking world which our early Sages inhabited. On that note, what do we make of “Alexander”? A great number of Jews both modern and ancient (there is Alexander Yannai and Rabbi Alexandri in the Talmud) have this name. Some cite a famous Midrashic account of Alexander the Great’s arrival in Jerusalem as being proof that while Alexander is not a Hebrew name, it is something of an “honorary” Jewish name. This requires a more careful analysis. Is Alexander a Jewish name? According to one tradition, the priests at the time wanted to honour Alexander for his kindness, and named all the boys born that year “Alexander”. In another version, Alexander was given a tour of the Holy Temple and, naturally, wished to place a statue of himself inside. Since this was impossible (but they couldn’t refuse the emperor), Shimon haTzadik convinced him that it would be a greater honour for all the children born to be named “Alexander”. Either way, some like to say that “Alexander” has become a Jewish name ever since. Apparently, when Midrash Rabbah was composed—just like today—it was common for Jews to have a non-Jewish name that they would use regularly, together with a Hebrew name that they would use only in Jewish circles. The Hebrew name “Benjamin” was often paired with “Alexander”. We see from the Midrash above that it is important to have a Hebrew or Jewish name. But what exactly counts as a “Jewish” name? Although today most Jews insist on having Hebrew or Biblical names (and rightly so), it seems that our Sages weren’t so strict in this regard. Indeed, many of them bore Greek, Latin, or Aramaic names with no second Hebrew name. Akiva, Avtalyon, Nechunia, Mani, Nittai, Nehorai, Adda, Papa, Simlai, Tanhum, Tarfon, Ulla, and countless others are cited in rabbinic literature. As we saw earlier, those that did have Hebrew names naturally chose names that would be palatable to the surrounding Greeks, much like many Jews today choose names that have easy English homonyms. Having said that, many have linked these names to Biblical characters. For example, Benjamin is described in the Torah as a wolf (Genesis 49:27), so some carried the name “Binyamin Wolf”, where the former was their actual Jewish name while the latter was their social name. The same goes for “Yehuda Leib”, where Leib means “lion”, like Aryeh, the symbol of the Biblical Yehuda. It has even become common to combine all three to form “Yehuda Aryeh Leib”. Similarly, there’s “Naftali Tzvi Hirsch”, since the Biblical Naftali is described as a deer, ayalah or tzvi, and “Hirsch” is German for “deer”. “Schneur”, too, is of non-Jewish origin, and comes from the Spanish name Senor (and is sometimes a German equivalent for Seymour). Chassidim have since reinterpreted it in the Hebrew as Shnei Or, “two lights”. It probably didn’t have this meaning when it was given to Schneur Zalman of Liadi, the founder and first rebbe of Chabad. In his case, “Schneur” was likely meant to be his social name while “Zalman” (Solomon, or “Shlomo) was his traditional Jewish or Hebrew name. Sephardic Jews are just as culpable. Many have Arabic names like “Massoud” (which means “lucky”) or “Abdullah”. In fact, Rav Ovadia Yosef’s birth name was Yusuf Abdullah, and it was only when the family made aliyah to Israel that “Abdullah” was replaced with its Hebrew translation “Ovadia” (which is a Biblical name). At one point, a popular female Sephardic name was “Mercedes”. This one is highly problematic, as it happens to be a Spanish appellation for the Virgin Mary! (The automobile brand Mercedes is named after a Jewish girl of that name, the daughter of the company’s founder Emil Jellinek and his French-Sephardi wife.) A similar problem lies with the very popular “Natalie”, which literally means “Christmas” in Latin. Is it okay to bear such names? A distinction must be made between those that clearly have an idolatrous origin versus those that were simply adapted from non-Jewish names but still carry a good meaning. The latter are certainly permissible, since many of our great Sages had such foreign names. Over time, many of these evolved a deeper, Jewish meaning. 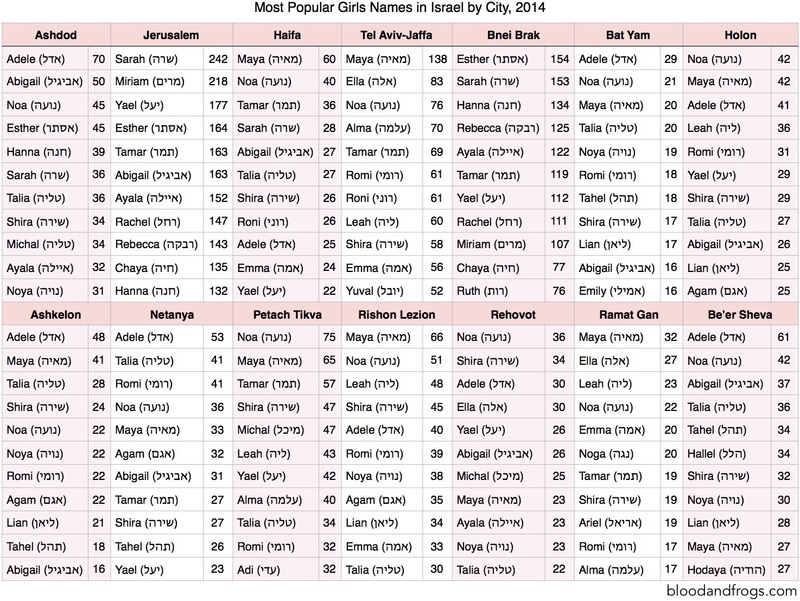 For instance, Adele was a classic German name (meaning “noble”) and yet the Baal Shem Tov chose it for his daughter. He explained to his chassidim that he received this name through divine inspiration, and that it is an acronym (אדל) for the important words in the Torah אש דת למו—that God gave His people “a fiery Torah” (Deuteronomy 33:2). The Torah, like fire, purifies all things. The Baal Shem Tov’s daughter went on to become a holy chassid of her own, imbued with so much Ruach haKodesh that she was nicknamed Adele HaNeviah, “Adele the Prophetess”. There are numerous other examples. Susanna is Shoshana (שושנה), and Abigail is Avigayil (אביגיל). In the Tanakh, the latter makes an important comment about names, pointing out that because her first husband’s name was Naval (“abomination”) he acted abominably (I Samuel 25:25). She later married King David and is considered a prophetess in her own right. Iscah. This is Sarah, because she would see [סוֹכָה] through divine inspiration, and because all gazed [סוֹכִין] at her beauty. Alternatively, יִסְכָּה is an expression denoting princedom [נְסִיכוּת], just as Sarah is an expression of dominion [שְׂרָרָה]. Hath not a Jew eyes? Hath not a Jew hands, organs, dimensions, senses, affections, passions; fed with the same food, hurt with the same weapons, subject to the same diseases, heal’d by the same means, warm’d and cool’d by the same winter and summer as a Christian is? If you prick us, do we not bleed? If you tickle us, do we not laugh? If you poison us, do we not die? And if you wrong us, shall we not revenge? If we are like you in the rest, we will resemble you in that. Shylock argues that his own villainy is nothing but a reflection of the villainy of the Christian world. Shakespeare recognized the cruelty that Jews had suffered, and tells his anti-Semitic audience that Jews are human, too. The Talmud (Rosh Hashanah 16b) also notes that changing one’s name is one of five things a person can do to change their fate. Indeed, we see this multiple times in Scripture. Abraham and Sarah have their names changed (from Abram and Sarai) to allow them to finally have a child. Jacob becomes Israel, while Hoshea becomes Yehoshua (Joshua). At some point, Pinchas becomes Eliyahu, and even Yosef (Joseph) becomes Yehosef (Psalms 81:6). On that last name change, the Midrash explains that it was only because Yosef had an extra hei added to his name that he was able to ascend to Egyptian hegemony. Thus, having a name with a deep meaning, in Hebrew letters, and one that is actually used regularly (as opposed to a secondary Hebrew name that no one calls you by) is of utmost significance. If you don’t yet have such a name, it isn’t too late to get one! *This Midrash presents a possible contradiction: how can it say that the Israelites did not adopt Egyptian names when we see that some clearly did? Maybe most of the Israelites did not adopt Egyptian names, though some did. Thankfully, another Midrash (Pesikta Zutrati on parashat Ki Tavo) steps in to offer an alternate reason. Here, Israel was redeemed in the merit of three things: not changing their clothing, their food, and their language. Changing their names is conspicuously absent. This entry was posted in Personal Development and tagged Aaron, Abigail, Adele, Alexander the Great, Alter Rebbe, Apollo, Aramaic Names, Baal Shem Tov, Chizkuni, Christianity, Egyptian Names, Elijah/Eliyahu, Elizabeth, Fate, Greek, Greek Names, Hebrew, Hebrew Names, Ibn Ezra, Jessica, Jewish Names, John, Josephus, Lazarus, Mercedes, Midrash, Midrash Rabbah, Moses, Names, Natalie, Naval, Pharaoh's Daughter, Phoebus, Pinchas, Rabbi Meir, Rav Ovadia Yosef, Samson (Shimshon), Sarah, Shakespeare, Shimon (Simon), Shimon HaTzadik, Shylock, Soul, The Merchant of Venice, Thermuthis, Yoma (Tractate) on July 2, 2018 by Efraim Palvanov. Did Moses Have a Black Wife? Towards the end of this week’s Torah portion, Behaalotcha, we read that “Miriam and Aaron spoke against Moses because of the Cushite woman whom he had married, for he had married a Cushite woman.” (Numbers 12:1) This verse brings up many big questions, and the Sages grapple with its meaning. Who is this Cushite woman? When did Moses marry her? Why did Miriam and Aaron speak “against” Moses because of her? Why the superfluous phrasing of mentioning twice that he married the Cushite woman? What does “Cushite” even mean? Traditionally, there are two main ways of looking at this passage: either Moses actually took on a second wife in addition to his wife Tzipporah, or the term “Cushite” simply refers to Tzipporah herself. The second interpretation is problematic, since we know Tzipporah was a Midianite, not a Cushite. The term “Cushite” generally refers to the people of Cush, or Ethiopia, and more broadly refers to all black people or Africans. Scripture does connect the Cushites with the Midianites in one verse (Habakkuk 3:7), which some use as proof that the Midianites were sometimes referred to as Cushites, or had particularly dark skin. ‘The Fight at Jethro’s Well’ – where Moses first meets Tzipporah – scene from ‘The Ten Commandments’ (1953) painted by Arnold Friberg. Rashi (Rabbi Shlomo Itzchaki, 1040-1105) prefers the second interpretation. He says that Tzipporah was called a “Cushite” because she was very beautiful. He cites Midrash Tanchuma in stating that just as everyone can immediately identify a black person (Cushite), everyone immediately recognized the incomparable beauty of Tzipporah. The same Midrash offers another possibility: apparently if a person had a very beautiful child in those days, they would call them “Cushite” to ward off the evil eye. This suggests that a Cushite was not considered beautiful at all, yet Rashi provides a numerical proof that Cushite does indeed mean “beautiful”, since the gematria of Cushite (כושית) is 736, equal to “beautiful in appearance” (יפת מראה), the term most frequently used in the Torah to describe beauty. If the Cushite is Tzipporah, then why did Miriam and Aaron suddenly have a problem with her? Rashi cites one classic answer: because Moses had become so holy—recall how after coming down Sinai, his skin glowed with such a blinding light that he had to wear a mask over his face—he had essentially removed himself from this material world. This means he was no longer intimate with his wife Tzipporah. Miriam had learned of this, and thought Moses was in error for doing so. Unlike certain other religions, Judaism does not preach celibacy, and does not require complete abstinence to remain holy and pure. Conversely, Judaism holds that sexual intimacy is an important aspect of spiritual growth. The famous Iggeret HaKodesh (the “Holy Letter”, often attributed to the Ramban, Rabbi Moshe ben Nachman, 1194-1270, but more likely written by Rabbi Joseph Gikatilla, 1248-1305) writes that it is specifically during sexual union (if done correctly) that a man and woman can bring down and experience the Shekhinah, God’s divine presence. 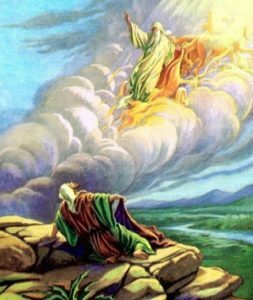 God makes it clear to Miriam and Aaron that although they are also prophets, they are nowhere near the level of Moses. In all of history, Moses alone was able to speak to God “face to face”, while in a conscious, awake state. All other prophets only communed with God through dreams or visions, while asleep or entranced. The explanation above is certainly a wonderful one, yet it is hard to ignore the plain meaning of the text: that Moses actually married a Cushite woman. The repetitive phrasing of the verse seems like it really wants us to believe he had taken another wife. And many of the Sages agree. However, Moses hadn’t married her at this point in time, but many years earlier. The Midrash describes in great detail what Moses was up to between the time that he fled Egypt and arrived in Midian. After all, he had fled as a young man, and returned to Egypt nearing his 80th year. What did he do during all those intervening decades? The Midrash (Yalkut Shimoni, Shemot 168) says that Moses initially fled to Cush. At the time, the Cushites had lost their capital in a war and were unsuccessful in recapturing it. Their king, named Koknus (קוקנוס, elsewhere called Kikanos or Kikianus), fought a nine-year war that he was unable to win, and then died. The Cushites sought a strong ruler to help them finally end the conflict. They chose Moses, presumably because he had fought alongside the Cushites and had a reputation as a great warrior. Moses did not disappoint, and devised a plan to win the war and recapture the Cushite capital. (His enemy was none other than Bilaam!) The grateful Cushites gave Moses Koknus’ royal widow for a wife, and placed him upon the throne. This Midrash is very ancient, and was already attested to by the Jewish-Roman historian Josephus (37-100 CE). Josephus writes (Antiquities, II, 10:239 et seq.) a slightly different version of the story, with Moses leading an Egyptian army against the Cushites. The Cushite princess, named Tharbis, watches the battle and falls in love with the valiant Moses. She goes on to help him win the battle, and he fulfils his promise in return to marry her. In some versions, Moses eventually produces a special ring that causes one to forget certain events, and puts it upon Tharbis so that she can forget him. He then returns to Egypt. So, Moses married a Cushite queen. Yet, he remembered “what Abraham had cautioned his servant Eliezer” about intermarriage, and abstained from touching her. (If you are wondering how Moses later married Tzipporah, who was not an Israelite, remember that the Midianites are also descendants of Abraham through his wife Keturah, see Genesis 25:2. Thus, Moses still married within the extended family of Abrahamites.) Although Moses married the Cushite queen, he never consummated the marriage. The Midrash says he reigned over a prosperous Cush for forty years until his Cushite wife couldn’t take the celibacy anymore and complained to the wise men of Cush. Moses abdicated his throne and finally left Ethiopia. He was 67 years old at the time. All of this was kept secret until it came out publicly in this week’s parasha. This is a terrific version of the story, but it doesn’t answer why Miriam and Aaron complained to Moses. For this we must look to the mysticism of the Arizal. The Arizal cites the above Midrash in a number of places (see Sefer Likutei Torah and Sha’ar HaPesukim on this week’s parasha, as well as Sha’ar HaMitzvot on parashat Shoftim). He explains that both Tzipporah and the Cushite were Moses’ soulmates. This is because Moses was a reincarnation of Abel, who had two wives according to one tradition. This was the reason for the dispute between Cain and Abel, resulting in the latter’s death. Cain was born with a twin sister, and Abel was born with two twin sisters (otherwise, with whom would they reproduce?) Cain reasoned that he should have two wives since he was the older brother, and the elder always deserves a double portion. Abel reasoned that he should have the second wife since, after all, she was his twin! Cain ultimately killed Abel over that second wife. Therefore, the Arizal explains that Cain reincarnated in Jethro, and Abel in Moses. This is why Jethro gave his daughter Tzipporah to Moses, thus rectifying his past sin by “returning” the wife that he had stolen. * Moses’ other spiritual twin was the Cushite woman. The Arizal states that Miriam and Aaron were aware of this, and were frustrated that Moses did not consummate his marriage to the Cushite, for she was his true soulmate! Apparently, after the Exodus Moses summoned the Cushite woman and she happily joined the Israelites and converted to Judaism. However, this was after his time on Sinai, when he had become entirely holy, so it was too late to consummate the marriage. When Miriam heard about this, she brought the complaint to Moses. And so, whatever the case may be, the crux of the matter is Moses’ separation from his wife (or wives). Having said all that, there is a third possibility. This comes from a simple reading of the Torah text, and the lesson that we learn from it is particularly relevant today. If the issue was about Moses separating from his wife, it isn’t clear why Miriam would be punished with tzara’at (loosely translated as “leprosy”). Rashi, for one, does not seem to offer a clear explanation why this in particular was her punishment. Of course, we know that God doesn’t really “punish”, and simply metes out justice, middah k’neged middah, “measure for measure”. It is therefore totally fitting that in complaining about Moses taking a black woman as a wife, Miriam’s own skin is turned white “like snow”. Perhaps God wanted to remind her that she is not so white herself. We can learn from this that there really is no place for racism in Judaism. In fact, God explicitly compares the Israelites to the Cushites (Amos 9:7), and maintains that He is not the God of the Jews alone, but the God of all peoples: “‘Are you not as the children of the Cushites unto Me, O children of Israel?’ Said Hashem. ‘Have I not brought up Israel out of the land of Egypt, [just as I brought] the Philistines from Caphtor, and Aram from Kir?’” Among a list of nine holy people that merited to enter Heaven alive, without ever dying, the Sages include a Cushite man named Eved-Melekh (Derekh Eretz Zuta 1:43, see Jeremiah 39:16). I bring Heaven and Earth to witness that the Divine Spirit may rest upon a non-Jew as well as a Jew, upon a woman as well as a man, upon a maidservant as well as a manservant. All depends on the deeds of the particular individual. *The Arizal actually writes how Cain reincarnated in three people: Korach, Jethro, and the Egyptian taskmaster that Moses killed before fleeing Egypt. 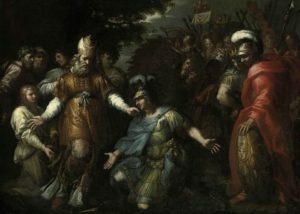 The rectification for the improper dispute between Cain and Abel was rectified in the dispute between Korach and Moses, with Moses’ victory. The rectification for the stolen wife was fulfilled by Jethro. And the rectification for Cain murdering Abel was that Moses, in return, killed the Egyptian taskmaster. Thus, all the rectifications were complete. We can see a hint in the name Cain (קין) to his three future incarnations: the ק for Korach (קרח), the י for Jethro (יתרו), and the ן for the Egyptian, whose name we don’t know but perhaps it started with a nun! This entry was posted in Kabbalah & Mysticism, Midrash, Mysteries & Origins and tagged Aaron, Abel, Abraham, Africa, Antiquities of the Jews, Arizal, Beauty, Behaalotcha, Bilaam, Book of Amos, Book of Habakkuk, Book of Jeremiah, Cain, Celibacy, Cush, Cushite, Derekh Eretz Zuta, Divine Retribution, Ethiopia, Eved-Melech the Cushite, Gematria, Humility, Jethro, Josephus, Keturah, Kikianus, Korach, Midian, Midianites, Midrash Tanchuma, Miriam, Moses, Prophecy, Prophet, Racism, Rashi, Reincarnation, Sefer Likutei Torah, Sephora, Sexuality, Sha'ar HaMitzvot, Sha'ar HaPesukim, Shekhinah, Sotah (Tractate), Tent of Meeting, Tharbis, The Holy Letter, Tzaraat, Tzipporah, Yalkut Shimoni on May 28, 2018 by Efraim Palvanov. Much of this week’s Torah portion, Nasso, describes the gifts that each of the Twelve Tribes brought for the inauguration of the Mishkan. Although each tribe brought the exact same set of gifts, the Torah nonetheless repeats the gifts each and every time. Some say this is because God held dear what every single tribe brought and wanted to properly acknowledge each one—even though it was all the same. Others say that while each tribe brought the same thing, the way they brought it was different, with each tribe displaying their own unique qualities. Another version puts the tribes in order of birth as opposed to their encampments in the wilderness. Thus, Reuben is Aries, Shimon is Taurus, and so on. 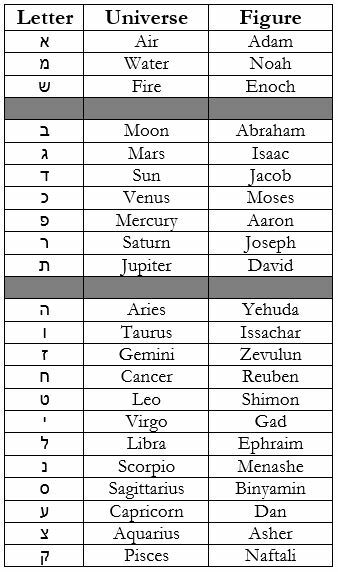 A third version (noted by Rabbi Yonatan Eybeschutz) also follows the order of birth, but starting from Rosh Hashanah, so Reuben is Libra and Shimon is Scorpio, etc. Nonetheless, the Midrashic version above is the most common, and the one most frequently adopted in Kabbalistic texts. 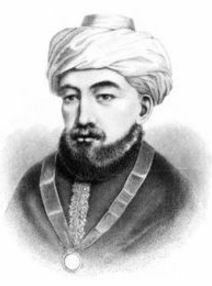 It was the system used by the Vilna Gaon (Rabbi Eliyahu Kramer, 1720-1797), and appears as early as Sefer Yetzirah, generally considered the oldest known Kabbalistic text. As we’ve written before, Sefer Yetzirah goes through the 22 letters of the Hebrew alphabet and explains how God fashioned the universe through them (together with the Ten Sefirot). It divides the alphabet into three major groupings: the “mothers”, the “doubles”, and the “elementals”. The mothers are the three letters aleph, mem, shin, corresponding to air (avir), water (mayim), and fire (esh). The doubles are the seven letters that have two sounds in Hebrew: beit (and veit), gimel (and jimel), dalet (and dhalet, like the English “that”), kaf (and khaf), pei (and fei), reish (and the hard ‘reish), tav (and thav, like the English “three”). Most modern speakers have dropped the jimel, dhalet, and ‘reish from use, while Ashkenazis pronounce the thav as “sav” (much like all Eastern Europeans with an accent, when speaking English, would say “sree” instead of “three”). The remaining single-sounding letters make up the twelve elementals. If the Twelve Tribes correspond to the twelve elemental letters, which Biblical figures correspond to the mothers and doubles? Sefer Yetzirah (3:2) does suggest that from the three mothers come the “fathers” (avot). However, it does not explicitly say that the fathers are Abraham, Isaac, and Jacob. 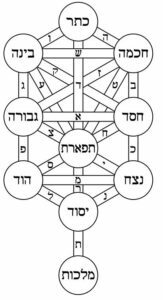 Generally, the seven doubles are paralleled with the seven lower sefirot, and the seven lower sefirot correspond to the Seven Shepherds of Israel, among whom the patriarchs are already included. So, the three mothers must parallel some other figures. Indeed, we see three major figures in the Torah before Abraham. These are Adam, Noah, and Enoch. Adam is, of course, the first civilized human, the first to be created, and originally a towering figure whose body shone with blinding light. Noah is at the other end of the pre-Abraham period, and was the righteous one in his generation that merited to recreate a new world. In between is Enoch, of whom the Torah curiously states that he “walked with God and was no more, for God had taken him” (Genesis 5:22). In mystical traditions, Enoch was taken up by God’s blazing divine chariot (much like Elijah would be far in the future), and was transformed into an angel, usually identified with Metatron. Although the Torah gives us essentially no information on Enoch, the Book of Jubilees (4:17-20) explains that Enoch was the first true sage in history. He was a scribe and an astrologer, created history’s first calendar, and taught people how to accurately count months and years. He was a great prophet in his own right, seeing all of the past and all of the future. So holy was he that he never died, and was transfigured into an angel. These three figures in Genesis neatly parallel the three mother letters of Creation: Adam being aleph, the first man, made in God’s image (which the letter aleph represents); Noah being mem, alluding to the flood waters; and Enoch being shin, alluding to the flaming chariot that took him to Heaven, and his transformation into a fiery archangel (joining the seraphim, literally the “blazing ones”). The seven doubles, meanwhile, are the Seven Shepherds. On the Tree of Life, the letter beit leads to Chessed, personified by Abraham; the letter gimel to Gevurah, personified by Isaac; the letter dalet to Tiferet, personified by Jacob; kaf to Netzach, which is Moses; pei to Hod, Aaron; reish to Yesod, Joseph; and tav to Malkhut, David. 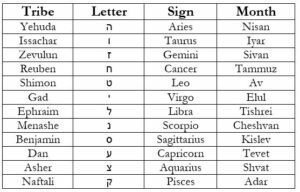 On a practical note, one can use this information to explore their name (or any Hebrew word for that matter) based on the meaning of its letters. If one understands the qualities associated with each letter, they may derive deeper meaning from their name, and how it may affect their own qualities, strengths, weaknesses, or even their destiny. It is important to note that although Sefer Yetzirah has Saturn for Friday (and Joseph), and Jupiter for Saturday (and David), there are other traditions. Jupiter (Tzedek) is more fitting for Joseph, called Yosef haTzadik, while Saturn (Shabbatai) is more fitting for Shabbat and King David. Yet another tradition has the moon for King David. On the level of Sefirot, this makes most sense, since the moon is a reflection of the sun much like Malkhut is often said to be a reflection of Tiferet. 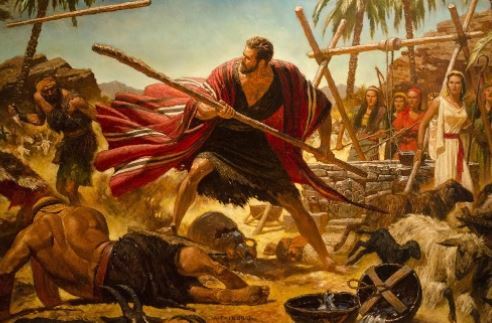 For example, Moses (משה) was famously thrown into the waters (מ) of the Nile as a newborn, led the Israelites through the waters of the Red Sea, and later had his fatal error by striking the rock for water. Meanwhile, he first encountered God at the burning bush (ש) and as a child burned his mouth with a smoldering coal (according to the Midrashic explanation for his later being “heavy of tongue”). In fact, the Arizal taught (Sha’ar HaPesukim on Ki Tisa) that Moses was a reincarnation of Noah, while other mystical texts compare him to an earthly Metatron. Finally, the hei in his name corresponds to Aries and the month of Nisan, symbolizing the pesach offering and the Exodus which happened in that month, under that sign. Thus, we see in the letters of Moses an allusion to essentially every major event of his life, and even his past life. Thankfully, Sefer Yetzirah provides us with the exact qualities associated with each letter. The seven doubles have both positive and negative aspects clearly stated (4:2-3). The twelve elementals, meanwhile, have a certain “foundation” (5:1), which may be used for good or for evil. The three mothers are described (3:7-9) based on the qualities of their element, fire being “hot” and water being “cold”, etc. They are also paralleled to a body part. While the qualities given in Sefer Yetzirah are not always so clear, there are many commentaries which help to extract the proper meaning. These are elucidated in detail in Rabbi Aryeh Kaplan’s monumental Sefer Yetzirah: The Book of Creation, In Theory and Practice. 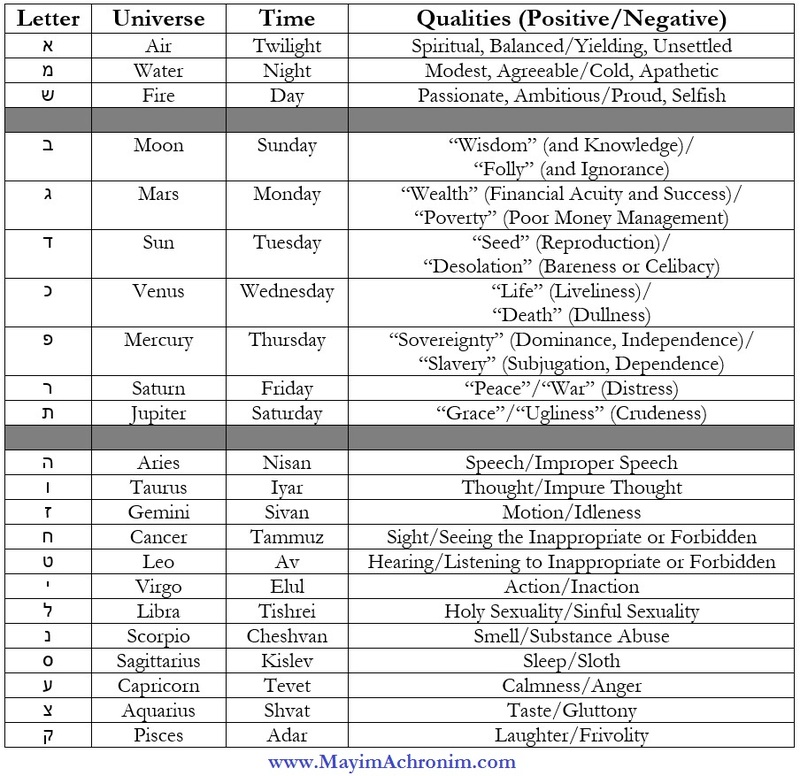 One can use the chart above to explore the features associated with each letter of their name, as well as the qualities associated with their astrological birth sign, birth month, birth day of the week, and even birth time of day. The positive qualities are potential traits that one has within and should work to express to the fullest, while the negatives are traits that one should be aware of and particularly focused on to repair. This entry was posted in Midrash, Personal Development and tagged Aaron, Abraham, Adam and Eve, Air, Alphabet, Aquarius, Aries, Arizal, Astrology, Book of Jubilees, Cancer (Astrology), Capricorn, Creation, Enoch, Fire, Gemini, Genesis, Hebrew Calendar, Isaac, Jacob, Joseph, Jupiter, Kabbalah, King David, Leo, Libra, Mars, Mercury, Metatron, Midrash, Moon, Moses, Nasso, Noah, Pisces, Planets, Primordial Elements, Rabbi Aryeh Kaplan, Ramban, Sagittarius, Saturn, Scorpio, Sefer Yetzirah, Seraphim, Seven Shepherds, Sha'ar HaPesukim, Shabbat, Sun, Taurus, Tree of Life (Sefirot), Twelve Tribes, Venus, Vilna Gaon, Virgo, Water, Yalkut Shimoni, Zodiac on May 23, 2018 by Efraim Palvanov.